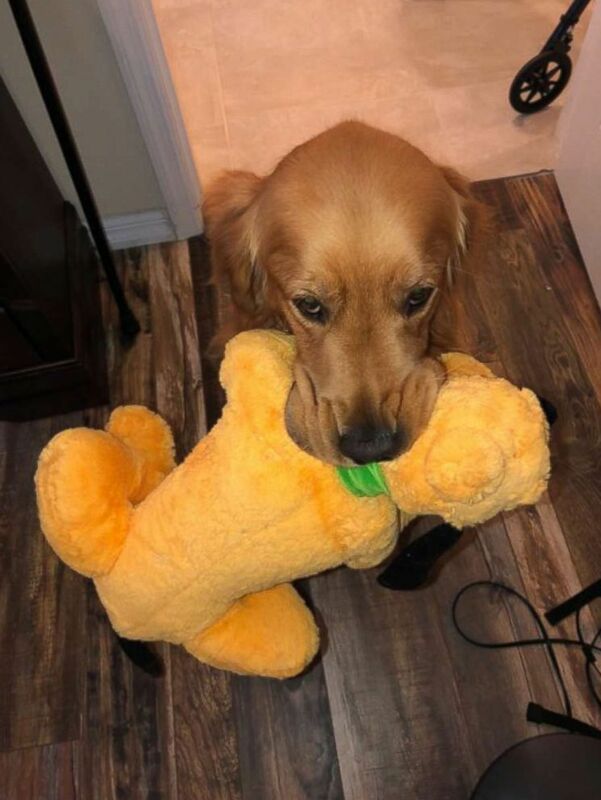 Atlas, a service dog with a stuffed Pluto toy at home, experienced a little magic during one his weekly trips to Disney World. The golden retriever was visiting the amusement park with his owner Julian Gavino and met a giant-sized version of his favorite character at Magic Kingdom. Atlas likes nothing better than chomping on his little stuffed yellow Pluto, Gavino told ABC News, a toy that Atlas "loves so much." That's until he came snout-to-snout with an oversized Pluto at the park. The long-overdue encounter finally came to pass when Atlas and Gavino, 22, who is in a wheelchair, visited the Japan Pavilion at Epcot Center Friday night. The two connected when Gavino, who has a connective tissue disorder called Ehlers Danlos Syndrome type 3, brought him home from New Horizons Service Dogs in Orange City, Florida. But when Atlas noticed Pluto, his tail wagged wildly, and he sniffed noses with Pluto. The character squatted to receive the dog, who licked an eyelid as one of Gavino's friends captured the precious moment on video. “Atlas was more than excited to meet his best pal look alike,” Gavino commented on his video, which since he posted it has gone viral.